One of the things I'd planned to do was some sewing. A few weeks ago I bought the Colette Ginger Skirt pattern. I found this fabric which came from my Granny; I haven't the fainted idea what it is, but it washes well and is lovely. This skirt took 2 1/2 days of solid work. I told Mr BB that there have been wedding dresses that probably didn't take so long to make! I'm thrilled with it!! :) :) :) It's 50 times better than the skirt I made a few months ago. I really took my time, and didn't fudge anything. The only bit I'm not pleased with is the top of the waistband where the zip attaches. I don't think I clipped the corners properly. 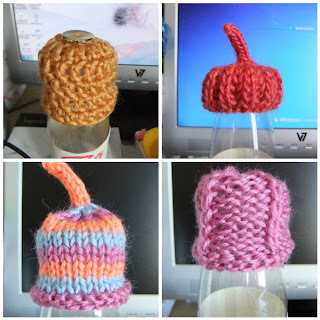 The instructions in the pattern were really easy to follow, and there were links to tutorials on the Colette website. Panic struck though when it came to putting the invisible zip in, because I don't have an invisible zipper foot. I also have no chance of being able to get said foot, since my machine is about 30 years old! But good old Google came to the rescue, and I found this fantastic tutorial using an ordinary zipper foot. I'm feeling extremely pleased with myself! And I will definately be making another one. It hopefully shouldn't take so long though, since I have a rough idea of what I'm doing now! I've also been doing a bit of knitting; I made this wee case for my phone from some left over sock yarn. The pattern is called Aran Ipod Carrier, and is free on Ravelry. I've also finished my Serpentine Socks, but I haven't taken a photo of them yet. And here are my next four Innocent Smoothie Hats, note the yellow one is crocheted. Get me!!! ;) Normally a hat takes me about 30 minutes, that one took 2 hours! Skirt is gorgeous Ozzy. I always find the A-line skirt is really flattering shape wise. What would we do without Google, eh! I Google just about everything, my sister must think I'm a genius, she asks me a question, I Google it then give her the answer. When in actual fact, I should just tell her not to be so lazy and Google it herself. Lol! I'm always impressed with your hats too. I really should make some, in between making Hexipuffs for the Beekeeper's Quilt. Enjoy the rest of your holiday! Great skirt and well done on crocheted hat :0) keep going.